Researchers have shown that 1 in 4 freshman gain nearly 5% of their body weight (an average of 10 pounds) in the first semester of college alone. The freshman 15 is a legitimate concern for students entering this whole new lifestyle called college. Why does this weight gain occur? There are a number of reasons why the extra 10 pounds can easily slip past the average student. The first year of college is an overwhelming change; less sleep, high stress, late night fast food runs, all you can eat cafeterias, unhealthy but cheap food options like macaroni and cheese, top ramen, and so many more! So what should students be eating, and how much? Why are those extra 10 pounds such a bad thing, and why should college students even care? 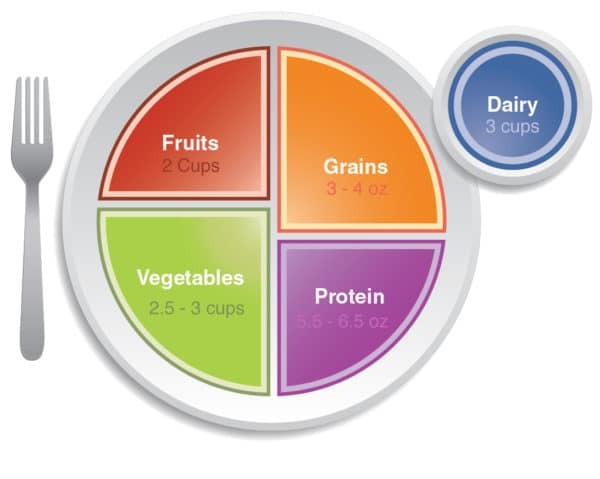 ChooseMyPlate.gov emphasizes the need for variety and making healthy choices everyday; even if they start out small and simple. It is important to include a variety of foods and colors with each meal. Different colored fruits and vegetables provide the body with different vitamins and nutrients necessary for health. Helps reduce the risk of heart disease by stopping LDL cholesterol from being deposited as plaque. Helps prevent the aging of skin, keeping it looking younger for longer. Can reduce the effect of estrogen promoting breast cancer cells in tissues. Can help reduce the risk of heart diseases, birth defects, and even liver problems. Encourages wounds to heal quickly. Supports healthy blood vessel function. Has been known to reduce inflammation. Is needed to create vitamin A (considered a precursor to vitamin A). Can lower the risk of coronary artery disease, stroke, and other age-related issues. Is known for its eye and vision benefits. These are known as having anti-viral, anti-inflammatory, and anti-allergenic benefits. Can help reduce the risk of stroke. Can help lower blood pressure. Is known for helping with anxiety and stress. Supports muscle strength, metabolism, water balance, and the nervous system. Helps protect against immune system deficiencies, and cardiovascular disease. Can reduce the risk of eye diseases. Helps keep skin young and healthy looking. Increases eye and vision health. Needed for strong bones and teeth. Can help with weight management. May reduce the risk of stroke. Can promote neurological health, and ward off neurological diseases. Keeps the eyes and vision healthy. Helps maintain a healthy skin. Considered a pro vitamin A, and is needed to make vitamin A.
Protects the artery lining for better blood flow. Reduces oxidative stress and prevents premature aging of cells. Are known for being an anti-viral, anti-inflammatory, and anti-allergenic. Can reduce the risk of breast cancer. Can reduce the risk of heart disease and liver problems. Keeps eyes and vision in proper working order. Can help boost the immune system. Promotes healthy skin and fast wound healing. Can help prevent heart-related issues; from high blood pressure, to congestive heart failure. Can help keep steady blood sugar levels. Helps keep the brain healthy with plenty of blood flow. Can help reduce the risk of diabetes. Why is it important to care about what food is healthy and what food is not? Beyond those 10 or so pounds college students may or may not gain, is a world of unknown side effects that unhealthy food can have on the body. Caffeine is a chemical found in coffee, tea, and many other products. Most college students enjoy not only their morning coffee or tea on a regular basis, but use it as a mid-day pick me up drink to get through their last few classes or study groups. But what is caffeine actually doing to the body? And what are some of the side effects? Caffeine can cause agitation, chills, dizziness, fainting, depression, rapid heartbeat, headaches, muscle twitches, insomnia, stomach pain, trouble breathing, and more! Sodium is found in an abundance of things; from canned soup, to TV dinners. Practically any kind of processed food is loaded up with sodium. As college students, it is all too easy to pull out a thing of top ramen, grab a frozen dinner, or eat packaged and refined foods all day. But what does this excess amount of sodium do to the body? Sodium can interfere with the kidney’s function to retain and get rid of water, slowing kidney function, and causing high blood pressure, kidney disease, and even more. Because sodium increases fluid retention, the high blood pressure that occurs can put strain on the heart and cause heart issues in the future. Even some stomach cancers have been linked back to a high sodium intake. These are found in a lot of the processed junk foods that college students like to conveniently eat during class or while they are studying. Things like potato chips, packaged cookies, twinkies, and more, could all end up causing diabetes, inflammation, damage to the blood vessels, increasing the risk of heart disease, and so much more. The kinds of refined sugars found in cereal, packaged snacks, and desserts is a real culprit for college students. High amounts of refined sugar and high fructose corn syrup can overload and damage the liver; much like alcohol damages the liver, high amounts of sugar can do the same thing, taxing the organ with more than it can handle. Sugar adversely affects insulin signaling as well; it fails to stimulate an insulin release, and can cause a person to eat more than necessary, which in turn can cause rapid weight gain. It also increases uric acid levels which increase the risk for heart and kidney disease. Plan Ahead of Time – If the dining hall gives out menus ahead of schedule, be sure to get one so that you can see what all is being prepared, and plan out how to make healthy choices before you even get there. Don’t Embrace the “All You Can Eat” Service – Even though dining halls are available for as much food as you want, start out with small portions and a small plate. You can always go back later if you really are still hungry. Fruits & Vegetables – Try to make at least half of your plate fruits and vegetables. And remember, the more colors the better. Don’t Stay – Once you have completed your meal, leave the dining hall, don’t stick around and think about what else might be tempting to eat. Desserts Only Once or Twice – Choose one or two days a week that you can have dessert, otherwise, skip the dessert table all together! For more dining hall suggestions check out chooseMyPlate.gov. Rather than keeping pre-packaged, high-sugar, and processed foods conveniently in the dorm room, give the mini fridge a makeover with a few of these tips. Vegetables – Keep some pre washed, pre cut vegetable packs in the fridge for easy snacking options. Fruit – Grab some fresh or frozen fruit to keep on tap for when hunger strikes. Hummus – This is an easy way to incorporate veggies into the diet; use it as a great dip for raw vegetables. Yogurt – These are a portable way to stay healthy on the run. Since they are pre-packaged it is easy to take them along to campus. You may think a dorm room is too small to cook any real food in, but these recipes will make you a believer! Check out a few of these healthy, and do-able recipes for right there in the dorm room. Pancake in a Mug – While it seems a bit unusual to bake a pancake in a cup rather than flip it on a griddle, this fun new version of a pancake is a great way to cook a healthy breakfast and top it with fresh fruits. Refrigerator Oatmeal – When you refrigerate this oatmeal overnight it soaks up the greek yogurt and turns into a soft textured oatmeal like the kind cooked on the stovetop or in a microwave. You’ll love the variations of fruit and toppings you can incorporate into this recipe. Vegetarian Burrito Bowl – Rather than go out and eat fast food, create a similar, but healthier version at home with this amazing burrito bowl recipe. Spiced Chickpeas – Even though you can’t turn those chickpeas into hummus in a dorm room, you can still enjoy them as a protein packed snack. Check out this delicious recipe for a go-to snack. Risotto – You don’t actually need a stove to make these delicious variations of risotto. Discover all kinds of different flavors and vegetables to add into these fancy dorm dinners. Need some more ways to eat healthy in college? Make a list and stick to it – It is easy to get to the grocery store, take a look around, and want to bring home all the packaged brownies, crackers, and more. Stick to the list you made and you won’t spend more money than anticipated. Replace meat with other proteins – Meat can be a very expensive purchase, but they are a great source of protein. So if you are ready to cut down on grocery store costs, find other ways to get protein in your diet by incorporating things like like nuts, beans, and soy. Or even choose poultry over red meat for a less expensive meat choice. A quick energy bar – Granola bars, protein bars, larabars, and even trail mix are a budget-friendly snack for when you are on campus and starving. Establish a routine – When you eat at the same times each day, and when you are routinely eating healthy snacks and meals, it is easier to stick to a budget AND stay healthy. Eat according to season – As fruits and vegetables come in season they will go on sale and be less expensive. Pay attention to the fresh produce in season and purchase items at that time. Find a co-op – Many college towns put together food co-ops where the price of fresh fruits and vegetables is far below what it normally is because they are buying in bulk; but you personally get a smaller portion of that food for the same cheap price. See if there is a co-op in your area! Follow healthy food bloggers – Many food bloggers will create healthy meals specifically for college students. Follow these bloggers for ideas and for shopping lists. Drink more water – Drinking water is not only great for the body, but it helps curb feelings of hunger. Sometimes when we are thirsty we don’t realize it is thirst, and mistake it for hunger instead. Next time you are hungry, try drinking a bottle of water before getting food.